When you think of the city of Copenhagen, you might very well think about bikes. Because unlike most cities, our city is full of bikes. 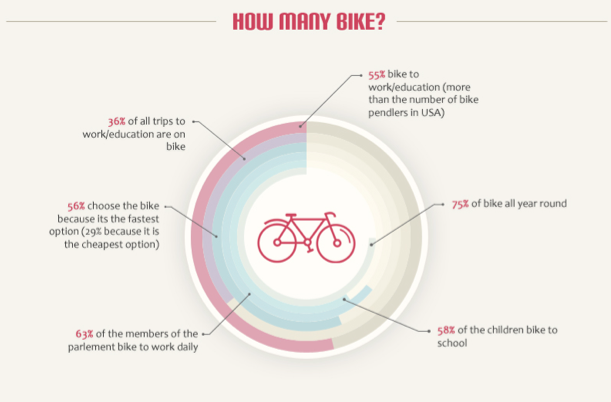 According to the infographic below from the Danish website Cykelvalg.dk there are more bikes than people in Copenhagen, and five times as many bikes as there are cars. Everybody is biking in Copenhagen. More than half the population bikes to work and school, and they don't only bike because it's cheaper and healthier than taking the car. We also bike because it's the fastest option: 56% choose the bike because it's the fastest option, whereas 29% because it's the cheapest option. Even the members of the parliament bike: 63% of them bike to work daily and so do 58% of the school children. A lot of people also have cargo bikes that they use to transport everything from children to mail. A impressive 17% of the families with children have a cargo bikes and the central post office have 306 such bikes. Mads Phikamphon lives in Copenhagen. 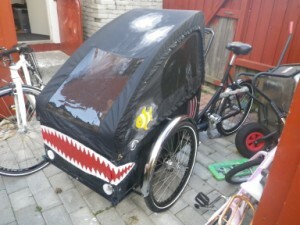 He bikes all year round and can often be seen transporting his 2 children in a Christiania cargo bike. This is the cargo bike he uses to transport his kids to school. Mads is currently making the site Cykelvalg to help Danish people compare bicycle prices from many different shops. This is the first installment of a new dandy series in which we do short interviews with bike bloggers from around the world.